Not only are these amp sims free, but they are also excellent. The Lextac has a very Rock sound (derived from the californian amps Bogner), the LE456 is more Metal-oriented (derived from Engl's Powerball amplifier), and the HyBrit sound British (Marshall). Legion is not based on any real amp. The latest one, Lecto, emulates the Rectifier. These amp sims sound absolutely great and you can easily find settings to suit the sound you're looking for. Please note that these plugins are "donationware", so they are free, but you are encouraged to make a donation to their creator from his official website. These amplifier simulators are provided as "DLL" files. They must be used within a host software, like a D.A.W., and are therefore not usable alone. Click here to know how to use them. This simulator offers two Marshall amps in one: The MCJ channel emulates a JCM800, and the PLS channel emulates a Plexi Super Lead 100. This simulator emulates the Engl Powerball amplifier. Lecto emulates channels 2 and 3 of a Mesa Boogie Dual Rectifier. Legion isn't based on a real amplifier. The purpose of his creator was to make a powerful simulation. This simulator is based on the Bogner Ecstasy XTC amplifier. LePou's very first amplifier simulation. This is version 2.11. This is an emulation of a Soldano SLO-100 amplifier. You may download the simulators from here, but please download preferably from the official LePou's website and if you like and use his plugins, donate from his website!!! * Les Paul-shaped guitar, the brand is SR Guitars, equipped with 3 pickups: a modern Humbucker neck pickup, a vintage P90-like middle pickup, a vintage Humbucker bridge pickup. * Fender Stratocaster American Deluxe with stock pickups. * Fender Telecaster American Deluxe with 2 Humbucker custom pickups : The neck pickup is a Lollar Regal, the bridge pickup is a Fender Wide Range. Simon used the Lollar for demos with distorsion, and the Fender for clear demos. * Each demo includes two guitar tracks, recorded separately (no copy and paste), and panned right and left in the stereo field. * With each demo, two different impulse responses (different microphones) were used with each guitar. * No distorsion pedal was used, in order to show whether or not the simulations can produce the distorsion needed in some musical genres. The settings of each demo are identical for all three guitars. Some demos will sound better with one guitar than it will on the other two. For instance, in Nirvana's demos, the sound of the Mercuriall demos recorded with a Telecaster is closer to the original sound than what I got with a Les Paul or a Stratocaster, because I made the settings for Telecaster first. Ideally, each amp sim tested should use different impulses, in order to find the microphone and the positionning that fits the amp best, as you would do when recording real amps with real microphones. Unfortunately, this would take me a considerable amount of time to do, and I cannot afford to do that. All the impulses I used for these demos are from Redwirez. No EQ was applied, I just added a slight compression on some demos, and a bit of reverb so that it doesn't sound too dry. These tests help to demonstrate how important the choice of an impulse is. From my experience, I would estimate that the sound you get is: 30% from the guitar you use, 30% from the amplifier head, and 40% from the impulse. Of course, these values will vary according to the pickup settings on your guitar, the settings of the amplifier, and the use of either a clean or a highly distorted sound will greatly influence the relative importance of these elements. 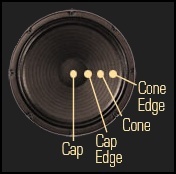 The closest the microphone from the center of the speaker, the less proximity effect you get, and so you get less lows. The closest the microphone from the cab, the more precision you get. By moving the microphone farther, the sound becomes less "harsh". A good old-school Hard Rock sound from the early 80s for this famous riff by ACDC. 1 impulse of Marshall 1960A cab (loudspeaker: G12M) through a microphone Neumann U67 in Cap Edge position, at a distance of 2 inches (5 cm). Stereo panning: 100% left. 1 impulse of Marshall 1960A cab (loudspeaker: G12M) through a microphone Neumann U87 in Cap Edge position, at a distance of 4 inches (10 cm). Stereo panning: 100% left. 1 impulse of Marshall 1960B cab (loudspeaker: V30) through a microphone Shure SM57 in Cap Edge position, at a distance of 1 inch (2.5 cm). Stereo panning: 100% right. 1 impulse of Marshall 1960B cab (loudspeaker: V30) through a microphone Royer R-121 in Cap position, at a distance of 3 inches (7.6 cm). Stereo panning: 100% right. 1 impulse of Fender Dual Showman cab (loudspeaker: JBL D130) through a microphone AKG C414B-ULS in Cap Edge position, at a distance of 4 inches (10 cm). Stereo panning: 100% left. 1 impulse of Fender Dual Showman cab (loudspeaker: JBL D130) through a microphone Neumann U47 in Cap position, at a distance of 2 inches (5 cm). Stereo panning: 50% left. 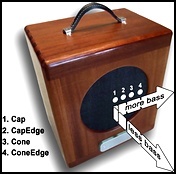 1 impulse of Marshall '68 Basketweave cab (loudspeaker: Celestion G12H30) through a microphone AKG C414B-ULS in Cap position, at a distance of 4 inches (10 cm). Stereo panning: 100% right. 1 impulse of Marshall '68 Basketweave cab (loudspeaker: Celestion G12H30) through a microphone Neumann U47 in Cap Edge position, at a distance of 4 inches (10 cm). Stereo panning: 50% right. 1 impulse of Bogner Uberkab cab (loudspeaker: Celestion G12T-75) through a microphone Shure SM57 in Cap position against the cloth. Stereo panning: 100% left. 1 impulse of Bogner Uberkab cab (loudspeaker: Celestion G12T-75) through a microphone Earthworks TC30 in Cap position against the cloth. Stereo panning: 100% left. 1 impulse of Marshall 1960B cab (loudspeaker: Celestion G12T-75) through a microphone Shure SM57 in Cap position against the cloth. Stereo panning: 100% right. 1 impulse of Marshall 1960B cab (loudspeaker: Celestion G12T-75) through a microphone Earthworks TC30 in Cap position against the cloth. Stereo panning: 100% right. Undoubtedly one of the most famous solos ever, a true standard that I couldn't ignore here. It was played by Jimmy Page with a Fender Telecaster and a Supro amplifier, from what I could find. 1 impulse of Supro Thunderbolt cab (loudspeaker: Jensen 15") through a microphone Sennheiser MD409 in Cone position, at a distance of 2 inches (5 cm). Stereo panning: 10% left. 1 impulse of Supro Thunderbolt cab (loudspeaker: Jensen 15") through a microphone Neumann U87 in Cone position against the cloth. Stereo panning: 10% right. Another Metal sample from a well-known song by Metallica. Here, I leave the lows in their central position, I lower the mids quite a bit and raise the highs. The saturation is also pretty heavy, depending on the amp sim tested. 1 impulse of Mesa Rectifier cab (loudspeaker: V30) through a microphone Sennheiser MD421N in Cap position, at a distance of 2 inches (5 cm). Stereo panning: 100% left. 1 impulse of Mesa Rectifier cab (loudspeaker: V30) through a microphone Beyerdynamic M160 in Cap position, at a distance of 1 inch (2.5 cm). Stereo panning: 50% left. 1 impulse of Roland Jazz Chorus 120 cab (loudspeaker: Roland 12) through a microphone Royer R-121 in Cap Edge position, at a distance of 4 inches (10 cm). Stereo panning: 100% right. 1 impulse of Roland Jazz Chorus 120 cab (loudspeaker: Roland 12) through a microphone Shure SM57 in Cap position against the cloth. Stereo panning: 50% right. 1 impulse of Marshall 1960A cab (loudspeaker: G12M) through a microphone Shure SM57 in Cap position against the cloth. Stereo panning: 100% left. 1 impulse of Marshall 1960A cab (loudspeaker: G12M) through a microphone Beyerdynamic M160 in Cap Edge position, at a distance of 0.5 inches (1.3 cm). Stereo panning: 100% left. 1 impulse of Marshall 1960B cab (loudspeaker: JBL K120) through a microphone Shure SM7 in Cap position, at a distance of 2 inches (5 cm). Stereo panning: 100% right. 1 impulse of Marshall 1960B cab (loudspeaker: JBL K120) through a microphone Neumann M8 in Cap position, at a distance of 6 inches (15 cm). Stereo panning: 100% right. 1 impulse of Marshall 1960A cab (loudspeaker: G12M) through a microphone Shure SM57 in Cap position against the cloth. Stereo panning: 30% left. 1 impulse of Marshall 1960A cab (loudspeaker: G12M) through a microphone Beyerdynamic M160 in Cap Edge Off Axis position, at a distance of 1 inch (2.5 cm). Stereo panning: 90% left. 1 impulse of Marshall 1960A cab (loudspeaker: G12M) through a microphone Royer R121 in Cap Edge position, at a distance of 2 inches (5 cm). Stereo panning: 30% right. 1 impulse of Marshall 1960A cab (loudspeaker: G12M) through a microphone AKG C414 in Cap position, at a distance of 2 inches (5 cm). Stereo panning: 90% right. One of the most famous songs from Oasis, and probably one of the most covered songs around campfires. The original version is played with an acoustic guitar, so having it played here with an electric guitar might sound a bit strange, but this shows the ability of amp sims to offer a clean, and if possible a warm sound. 1 impulse of Marshall 1960B cab (loudspeaker: V30) through a microphone Shure SM57 in Cap position, at a distance of 4 inches (10 cm). Stereo panning: 100% left. 1 impulse of Marshall 1960B cab (loudspeaker: V30) through a microphone AKG C414B-ULS in Cap position, at a distance of 6 inches (15 cm). Stereo panning: 100% left. 1 impulse of Vox AC30 cab (loudspeaker: Silvers) through a microphone Electrovoice RE20 in Cap position, at a distance of 4 inches (10 cm). Stereo panning: 100% right. 1 impulse of Vox AC30 cab (loudspeaker: Silvers) through a microphone Neumann U47 in Cap position, at a distance of 2 inches (5 cm). Stereo panning: 100% right. 1 impulse of Hiwatt SE4123 cab (loudspeaker: Fane) through a microphone AKG C414B-ULS in Cap position, at a distance of 0.5 inches (1.3 cm). Stereo panning: dead center. 1 impulse of Hiwatt SE4123 cab (loudspeaker: Fane) through a microphone Royer R-121 in Cap position, at a distance of 0.5 inches (1.3 cm). Stereo panning: dead center. Simon Chenu created this short Blues demo especially for the Grebz website. The demo helps judging the ability of amp sims to generate a good old Blues sound. Please note that I added a spring reverb simulator (SpringAge from Overloud) to stick to the ambiance. 1 impulse of Fender Deluxe Reverb cab (loudspeaker: Oxford 12K5-6) through a microphone Neumann U87 in Cap Edge position against the cloth. Stereo panning: 40% left. 1 impulse of Fender Deluxe Reverb cab (loudspeaker: Oxford 12K5-6) through a microphone Shure SM57 in Cap Edge Off Axis position against the cloth. Stereo panning: 20% left. 1 impulse of Vox AC30 Blues cab (loudspeaker: Blues) through a microphone M8 in position Cap Edge position, at a distance of 0.5 inches (1.3 cm). Stereo panning: 40% right. 1 impulse of Vox AC30 Blues cab (loudspeaker: Blues) through a microphone Audix i5 in position Cap Edge Off Axis, at a distance of 2 inches (5 cm). Stereo panning: 20% right. Simon Chenu created this short Metal demo especially for the Grebz website. The demo helps judging the ability of amp sims to generate a Modern Rock sound. 1 impulse of Engl Pro 4x12 cab (loudspeaker: V30) through a microphone Shure SM57 in Cap position, at a distance of 1 inch (2.5 cm). Stereo panning: 100% left. 1 impulse of Engl Pro 4x12 cab (loudspeaker: V30) through a microphone AKG C414B-ULS in Cap position, at a distance of 1 inch (2.5 cm). Stereo panning: 50% left. 1 impulse of Marshall 1960B cab (loudspeaker: V30) through a microphone Shure SM57 in Cap Edge Off Axis position, at a distance of 1 inch (2,5 cm). Stereo panning: 100% right. 1 impulse of Marshall 1960B cab (loudspeaker: V30) through a microphone Sennheiser MD421N in Cap Edge position, at a distance of 3 inches (7,5 cm). Stereo panning: 50% right. This very famous arpeggio was recorded in 1964 by Hilton Valentine, guitarist of The Animals, with a Grtesch Tenessean guitar and a 30-watt Selmer Twin Selectortone amplifier. I don't have any impulses from this amp, so I picked other cabinets that are good for clean sounds: the Fender Deluxe Reverb and the Vox AC30, which became the amplifier of choice for The Animals after the Selmer. 1 impulse of Fender Deluxe Reverb cab (loudspeaker: Oxford 12K56) through a microphone Shure SM57 in Cap position against the cloth. Stereo panning: 100% left. 1 impulse of Fender Deluxe Reverb cab (loudspeaker: Oxford 12K56) through a microphone Neumann U47 in Cap position against the cloth. Stereo panning: 100% left. 1 impulse of Vox AC30 Blues cab (loudspeaker: Blues) through a microphone Neumann U87 in Cap position against the cloth. Stereo panning: 100% right. 1 impulse of Vox AC30 Blues cab (loudspeaker: Blues) through a microphone Shure SM57 in Cap position against the cloth. Stereo panning: 100% right. This demo allows to see how well amp sims can produce crystal-clear sounds. 1 impulse of Fender Deluxe Reverb cab (loudspeaker: Oxford 12K56) through a microphone AKG C414B-ULS in Cap position against the cloth. Stereo panning: 50% left. 1 impulse of Mesa Rectifier cab (loudspeaker: V30) through a microphone Shure SM57 in Cap position against the cloth. Stereo panning: 100% right. 1 impulse of Mesa Rectifier cab (loudspeaker: V30) through a microphone AKG C414B-ULS in Cap position, at a distance of 4 inches (10 cm). Stereo panning: 50% right. The purpose here is to get a vintage, raw sound. The impulses I chose are made after cabs equipped with Jensen loudspeakers, that Jack White seems to be very fond of. The original guitar sound is difficult to reproduce with amp sims alone, as Jack White used a Digitech Whammy stomp box, set down an octave, whereas I only use the amp in the demos. 1 impulse of Fender Twin cab (loudspeaker: Jensen C12N) through a microphone Beyerdynamic M160 in Cap Edge position against the cloth. Stereo panning: 75% left. 1 impulse of Fender Twin cab (loudspeaker: Jensen C12N) through a microphone Neumann KM84 in Cap Edge position against the cloth. Stereo panning: 25% left. 1 impulse of Fender Tweed Bassman cab (loudspeaker: Jensen P10Q) through a microphone Sennheiser MD441 in Cap Edge Off Axis position, at a distance of 2 inches (5 cm). Stereo panning: 75% right. 1 impulse of Fender Tweed Bassman cab (loudspeaker: Jensen P10Q) through a microphone Earthworks TC30 in Cone position against the cloth. Stereo panning: 25% right.